In Windows 10, you can rate or review only apps and games that you’ve installed, and you must be signed in with your Microsoft Account. 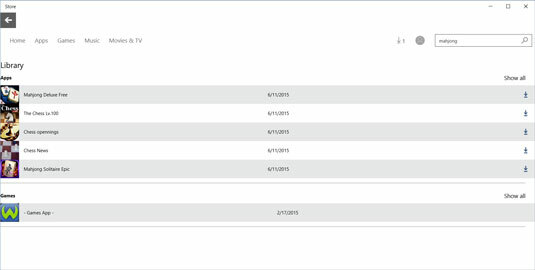 To rate or review a preinstalled app or game, install the app or game to associate the app with your Microsoft Account. Every app and game has a Rate and Review option. 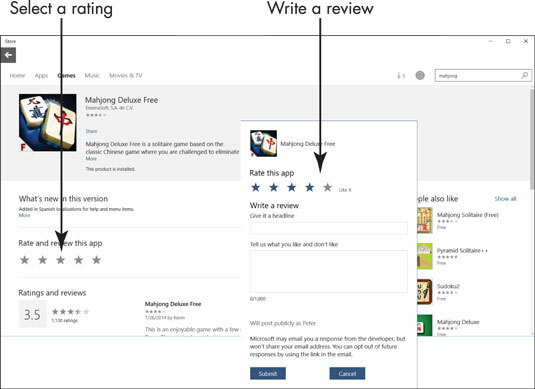 You can also select Write a Review on the details screen for that app in the Microsoft Store. On the Library screen, select the Mahjong Deluxe Free app or substitute any app you have installed. Go to the Rate and Review This App section of the Mahjong Deluxe Free window and select the number of stars you want to give this game. The Write a Review screen appears. In the Headline box, type a summary or overview of your comments, such as Great app or Needs work. In the Tell Us box, say what you will, up to 500 characters, including spaces and punctuation. Be helpful, if possible. Select the Submit button when you’re done with your review (or Cancel to abandon your review). Your comments may help another person decide whether to install an app. In addition, the app’s developer may use customer feedback to fix problems or add features. Your Microsoft Account name and picture, if you have one — but not your email address — appear with your review.